A cor Cadesign & Build SPRL(Belgium). 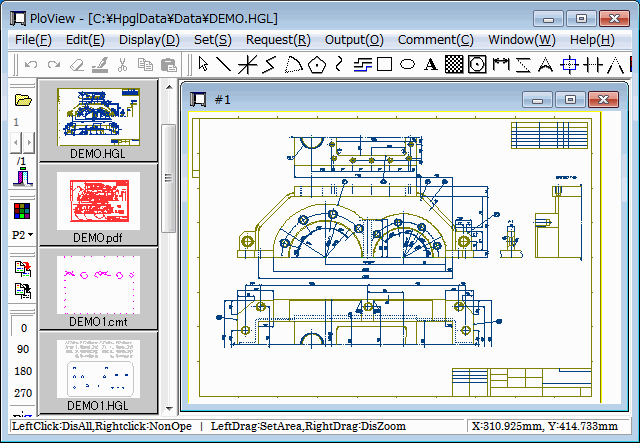 This HP describes PloView of Viewer and Converter which displays, edits, and converts various graphic files(HP-GL, HP-GL/2, HP RTL, PDF, DXF, DWG, GERBER, NC-Drill, IGES, SXF, TIFF, JPEG, BITMAP, EMF, PCX, FPX, PNG, GIF). 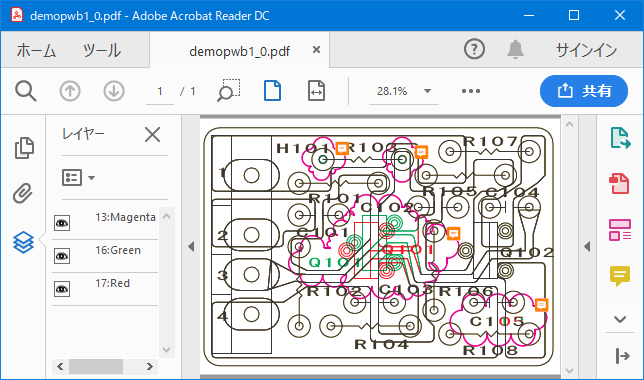 And, since PloView has about the same powerful input editing function as 2D-CAD, you can easily create other drawings by diverting design drawings. When selected file is view file, it can convert to comment, and edit. Open in order to see, when selected file is view file. In addition, comment can be added to view file in piles. When comment file is specified, it opens as a comment and can edit. When this check mark is applied, it will be opened whenever it selects file of file list, and will be displayed on the whole screen. It is convenient to see plural files continuously. When check mark is removed, it don't open until the Open button is pushed. When this check mark is applied and drawing file consists of multi-pages, it will be divided and read into two or more pages as a multi-page. When this check mark is removed and drawing file consists of multi-pages, all the pages will be read into the 1st page in piles. Hold down the Ctrl key or Shift key and select the file with the mouse. The Ctrl key can be selected one file at a time. The Shift key selects all the files between the first selected file in the file list and the second selected file. The order in which files are opened is the order in which they are displayed in the "File List" of this dialog. In the "File List", you can rearrange by combining the combo box in the upper right corner of this dialog with "Report" and clicking the cell at the top of the "File List". When you press the Ctrl key or Shift key, "MultiPage" turns ON, "Edit (open as comment)" and "Preview Mode" turns OFF. If you open multiple files in this way, the file will be expanded to the page. If one file is multi-page, this file will expand to multiple pages. Parent Window Displays the name of the first file in the title. Child Window Displays the file name of the open page in the title. The following abundant displaying operations are possible. Change of "page", "thumbnail", and "thumbnail + page" can be performed. Thumbnail displays all files under folder having selected drawing file. Usually, although displayed with color of pen and line width in drawing data, it is changeable with setup of pen. When this pen number is gray display, it is shown that this pen is not inputted into drawing data, and it is shown in case of bright display that this pen is inputted into drawing data. Display of this pen can turn OFF by removing check mark. When it draws with pen of the same color as background color, picture will disappear. When this check mark is checked, and background color and drawing pen are black, drawing pen will be changed white and will be drawn. When background color and drwaing pen are except black, set drwaing pen black and draw it. When input files are DXF, DWG, and IGES file, recommend check ON for this. In the case of GERBER file, recommend check OFF. Please refer to Subject and solution about color. Select "Copy" to see by over-writing. Select "Merge" to see overlap part by color mixing. Select "Xor", when making not visible place with which figure has overlapped. When following command of drawing data, select "Command in data". It becomes the color of pen No. specified by background pen No. If it is set as monochrome display mode, it will become black and white. 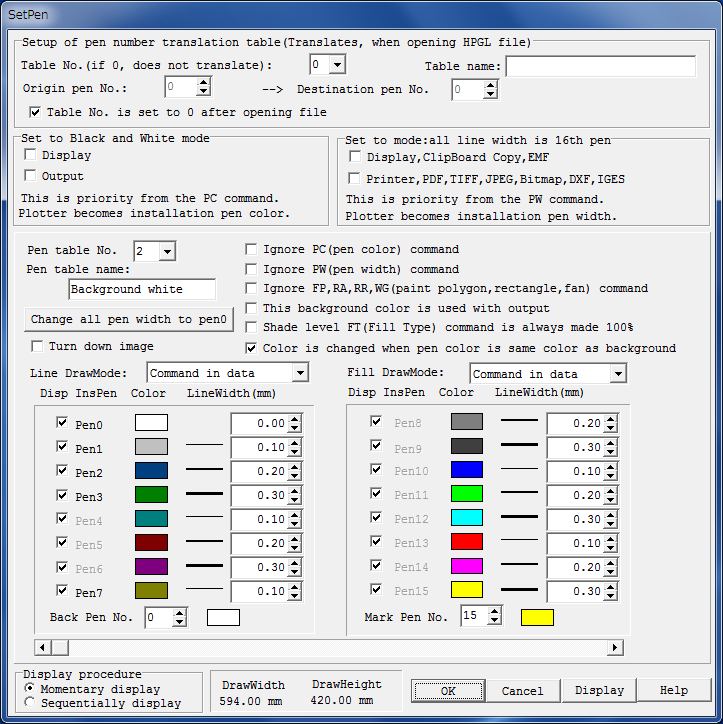 color of PC command of drawing data. Priority 3 will be applied if there is no PC command in drawing data. It becomes the color set up for every pen. "Set to mode: all line width is 16th pen". line width of PW command of drawing data. Priority 3 will be applied if there is no PW command in drawing data. It becomes the pen width set up for every pen. 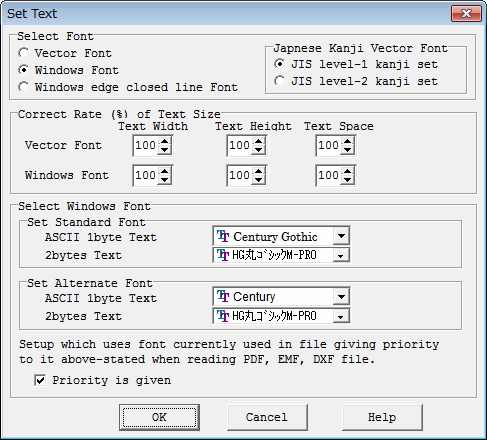 You can set the font size and font typeface of Windows font. The character shape is drawn with polygonal lines with a fixed line width, which is quite different from the Windows TrueType font. In general, Vector fonts display faster than Windows TrueType fonts. Displayed with the selected Windows TrueType font. Displays the selected Windows TrueType font as a closed-line character without filling it. Use it when you want to draw characters cut with a cutting plotter. You can select the unit system of coordinates and dimensions to use from the following. The following figure shows result after specifying P1 point and P2 point of Drawing data. 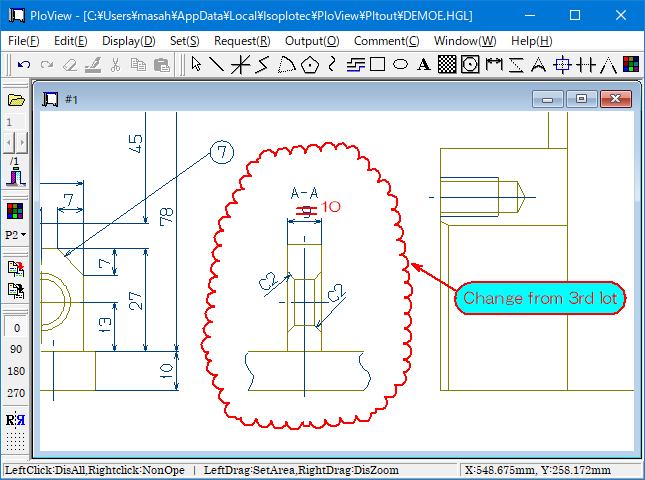 Line connected with specified line of vector drawing data can be searched. Search results are displayed on screen as the specified color. Since these search results are memorized temporarily, it will disappear, if it performs clearing search results or ending this program, or it searches connection of the next line, or it opens another file etc. If it is while having memorized, displaying, printer output, PDF output, DXF output, and clipboard copy can be performed for search results. The total line segment length of connected line who searched is displayed. Area is displayed that connected line has closed. Move the mouse cursor closer to the line, the line will be recognized. If mouse button is clicked here, continuous line is searched, and color is changed and displayed as shown next figure. Surface can be searched when you click closed line with the mouse left button. Surface is smeared away and search results are displayed on screen as color specified in "Surface color". Area of surface searched in dialog is displayed. Letter string of LB (label) command of HP-GL data is searched, and it expands and displays on middle of the screen. It can output to Windows printer or HPGL plotter. You can preview before output. Output on the scale specified here. If the paper is large with respect to the drawing area, a margin will appear, and if the paper is small, the drawing will be clipped. When this check mark is attached, the output scale is automatically set so that the drawing area fills the paper area excluding the paper margin. At this time, "OutScale" can not be set. Specify the paper standard loaded in the printer in "Paper standard" from the following. This function is effective when "AutoScale" check mark is not attached. The paper size according to the output drawing size is automatically determined from the standard paper size. Also, the paper direction is automatically determined Portrait and Landscape. If the printer does not support the paper size, or if the printer can not change the paper orientation, do not select its size or direction. When the output drawing size exceeds the maximum paper size that can be selected, select the maximum paper and automatically adjust the output scale so that the drawing size matches that paper size. When you select a file as an output destination in the plotter output, you can obtain the following HP-GL file. · The HP-GL specification of data can be selected from the following three types. Alternatively, get the HPGL file by dividing each page into separate files. 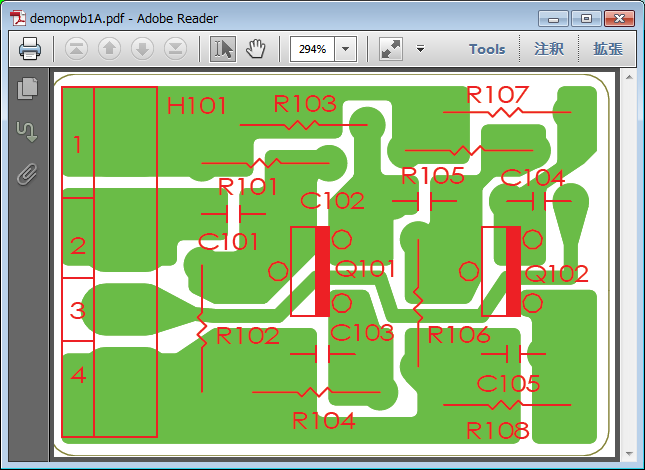 It can be used when "HPGL Plotter 1" or "HPGL Plotter 2" is selected for "Output Device". There are two output forms as follows. Combine each page of the opened file into one multi-page HPGL file. Divide each page of the opened file into separate HPGL files (one page). at the end of the output file name. It can output to PDF, DXF, DWG, TIFF, JPEG, Bitmap, PCX, FPX, GIF, PNG, IGES, SXF, WMF, PS, EPS, SVG, XPS, PCL and EMF file. Overprint is supported with PDF output. When this check mark is applied, OutScale will be automatically set up so that drawing area may fill paper area except PaperSpace. It becomes impossible to set up "OutScale" at this time. When check mark of "AutoScale" is OFF, it is effective, and specify scale factor to output in 0.01-100.0. Since case where output drawing size exceeds paper size will occur when this scale factor becomes large, cautions are required. In this case, message of "* Over Size !" is displayed on Output Plot Size field. Specify the paper size to be output. In the "Paper standard", specify the paper standard from the following. You can select fixed form paper (paper name, paper size, Portrait/Landscape) from the series at "Paper name width * height". By specifying "Atypical size", you can specify the width and height of the paper in the "Atypical Width" and "Atypical Height" fields. When "Drawing area + margin" is specified, the area containing "PaperSpace" is the paper size in the drawing area of the specified "OutScale". When "AutoPaperSelect" is specified, the optimum paper size is automatically selected from the area containing the "PaperApace" in the drawing area of the specified "OutScale", and Portrait/Landscape is also automatically selected. Combine each page of the opened file into one multi-page output file. Divide each page of the opened file into separate output files (one page). When "Line DrawMode" and "Fill DrawMode" are specified as "Merge" with Set-Pen menu and "CMYK" is selected for "PDF color operator" at the time of PDF output, overlapping figure will display by mixed color. In addition, in order to confirm mixed color by AcrobatReader, please start AcrobatReader, select edit-configuration menu, select "page display" of classification, and set "Use overprint preview" into "automatic" or "always". Display PDF data outputted by overprint OFF by AcrobatReader. Display PDF data outputted by overprint ON by AcrobatReader. ... The bottom of the overlapping figure is displayed. When outputting the layer, the attribute of the layer is included in the figure of the PDF file, and the display can be turned ON / OFF by the layer in the PDF viewer. Roll the pen color to the color shown below and output it as the layer. is output as the layer number. When you output the note annotation, the note annotation is included in the PDF file, you can check the note annotation with the PDF viewer, and enter change article etc in the note annotation. Do not add PDF note annotation. The sequence number is the order of entry of each view file → comment. annotation is automatically added to that position. It is the upper right corner of the cloud mark. With PloView and PloComp you can compare the same pages in two multi-page PDF files and get one multi-page PDF file with change area (cloud mark). "Output device" as "HPGL Plotter 2"
"Output form of page" as "Multi-file of one page"
Get one page HPGL file 1. Do the same operation for multi-page PDF file 2. Open the file of the same page of 1 and 2 files output in Step-1. Perform the same operation for all pages. Hold down the Ctrl key or Shift key and select all the files that you output in step 2 with the mouse. "Paper name" as "drawing area + margin"
"Layer output" to "Pen Color"
"Add PDF note annotation to cloud mark closed loop" as "Add sequence number"
"Output form of page" as "One file of multi-page"
"PDF color operator" as "CMYK (enable Merge)"
It is an example of overlapping multiple drawings into one product like the printed board. When you open this file you can see overlapping in PloView and you can use the layer function when outputting to PDF. Select the "File" "Open" menu, hold down the Ctrl key or Shift key and select all files with the mouse. You can see each file by page feed. "Output scale" is set to "1.0"
"Output form of page" as "Multi-page 1 file"
"Multi page" is set to "OFF"
The pages are displayed overlapping. 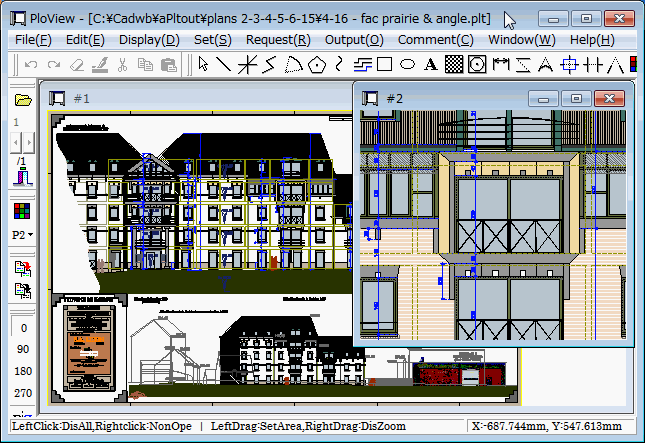 PloView has about the same powerful drawing input editing function as 2D-CAD as a comment function. When this function is used, postscript will be possible for existing drawing. And, existing drawing is diverted and another drawing can be easily created by performing addition, deletion, movement and change etc. for figure. Refer to the "Drawing editor of PloView and PloComp" for details of drawing edit function. - The next file can be read and edited. Page number of file links to layer number, and it is read. - Edit result can be saved in piles with view file at the next file. - It is necessary to install some printer drivers. Printer driver of high resolution is required to read PDF file. - It is necessary to install free software "Teigha File Converter" at input and output of DWG file. When used 30 days or more from installation, please remit the next licensing fee. Please download product from this HP. Since product is compressed into ZIP file, please extract it with suitable thawing software. There is a file called Readme.txt in the decompressed file, so read the product overview, installation method, uninstallation method, license agreement, licensing fee, license cancellation, protection release, inquiries, and version upgrade history. And since a file called Setup.exe is in extracted inside, it is installable if it double-clicks by Explorer. Opening to the public on HP serves both as trial and object for formal. All the function usage can be carried out free for 30 days from installation for trial. If 30 day will pass and password will not be entered, protection starts and product stops working. Please order the formal version, when you use more. It can pay with PayPal or credit card with the next button. Please refer to Readme.txt file to carry out bank transfer. Please send the next "order sheet" to e-mail address described at the last of this HP. The copyright holder will email the password when payment of the licensing fee has been confirmed. In order to enter password, when starting PloView.exe, it is necessary to carry out mouse right-click, to take out pop up menu, and to select "Run as administrator". Execute PloView and display 'Version Information' dialog box with the menu 'Help'-'Version Information' and input the password. Even if you replace exchange of OS, or installation personal computer, given password can release lock. However, the number which can install product in personal computer simultaneously is not exceeding ordered number. Revision up is free of charge. Software of new revision is downloaded and reinstalled from the Internet HP. - Customers can postpay by e-mail following procedures. Bank remittance is also possible instead of payment with PayPal. The bank remittance method is described in the Readme.txt file included in the installation file. (1) SXF output functions were added. (2) Defect of SXF input was repaired. (3) With DXF output, when there existed image, it repaired abnormal having outputted. 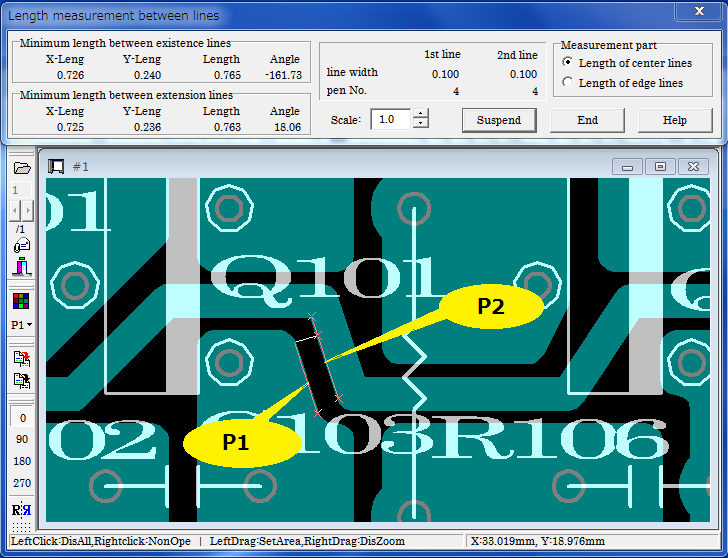 (4) Text of Vector font repaired fault which becomes dotted line and chained line sometimes with DXF and IGES output. (5) It supported to Windows10. (6) Abnormality display has been improved for arc of very small angle. (7) In PDF output etc., polygon-ized accuracy of very small circle painting out was raised. (8) It enabled it to set up judgment angle of very small arc or circle by "Set"-"Input file"-"Circle and arc judging angle". (9) Function when "#2 PlotterUnits by 1mm(Step Count)" was changed with Plotter Edit button of HPGL Plotter output was changed. (10) In the condition that file in which comment Bitmap exists is rotated and displayed, when HPGL Plotter output was carried out, it repaired displaying Bitmap on abnormal position. (11) With HPGL Plotter output, it repaired that Up and Down length of dotted line, dashed line, and chained line of comment was abnormal. (12) Problem when file with comment created by PloView before Ver.9.0 is opened was repaired. (13) Defect of LA (line attribute) command in case line end and joint shape are except being round was repaired. (14) "Initial of Line End Shape" of "Set-Line property" dialog was changed into "Shape of line end and joint". (15) Depending on PDF creation application, PDF version information may not match notation and entity. When such a PDF file was read, it was not able to read (error code=10000). It enabled it to read this. (16) When HPGL file was opened in the state of ON of "edit", it repaired that painting-out processing became abnormal. (17) When another command (point out menu or icon) was issued without pressing Enter key (end is illustrated) during comment input, it repaired that display was abnormal. (18) Insert comment into file which is not entered. And it outputs without displaying. Then, there was problem to which comment is not outputted. This was repaired. (19) After output, input comment without displaying. Then, there was problem to which color of dragging or rubber band of figure while input becomes strange. This was repaired. (20) Display command can be issued while comment input. (21) When Bitmap was in Macro of comment, other figures were displayed under Bitmap and had disappeared. This was improved so that other figures might be displayed on Bitmap. (22) When various outputs were performed after changing comment drawing size, it had not become drawing size after change. This defect was repaired. (23) When Macro input of comment was carried out after carrying out various setup, setup after change was not being reflected. This was repaired. (24) It was made to reflect "Ignore PC command" of SetPen in Macro input of comment. (25) When output drawing size is larger than paper size by preview of Printer-Plotter output, drawing of the right,left,upper and lower position was abnormal. This was repaired. (26) File of only comment data was opened, and when the number of plotter units set except 40 and carried out HPGL Plotter output, it repaired that output HPGL data became abnormal. (27) PayPal fee about licensing fee remittance which user had paid was eliminated. (28) When evaluation period goes out, or when uninstalling, function which fills in evaluation result and carries out e mail transmission was added. (1) At the time of comment input, function in which it can input after displaying comment property set Dialog and setting property was added. ON/OFF of this function can be performed by comment property set Dialog. (2) It enabled it to issue display command by key while comment input. (3) It was ignored when there existed Bitmap which black and white reversed in PDF and EMF input, and it repaired becoming whole surface black. (4) Display of FT command of HPGL was improved. (5) Fixed abnormally when opening some abnormal files. (1) The paper standard (ISO A0-A4, ISO B0-B5, JIS B0-B5, ANSI A-E, ARCH A-E,E1) can be set by specifying the paper size of the printer, PDF, TIFF, Bitmap, JPEG, GIF, PNG, PCX, FPX output Dailog. (2) At "File" - "Create new comment" command, or "Set" - "Comment draw area" command, drawing size can be selected from next paper standard paper size. (3) In the case of automatic paper selection with printer output, when the output drawing size exceeds the maximum paper size that can be selected, the largest paper is selected and the output scale is automatically adjusted so that the drawing size matches the paper size. (4) When selecting automatic paper for output (PDF, TIFF, Bitmap, JPEG, GIF, PNG, PCX, FPX), change the smallest paper selection order as follows. 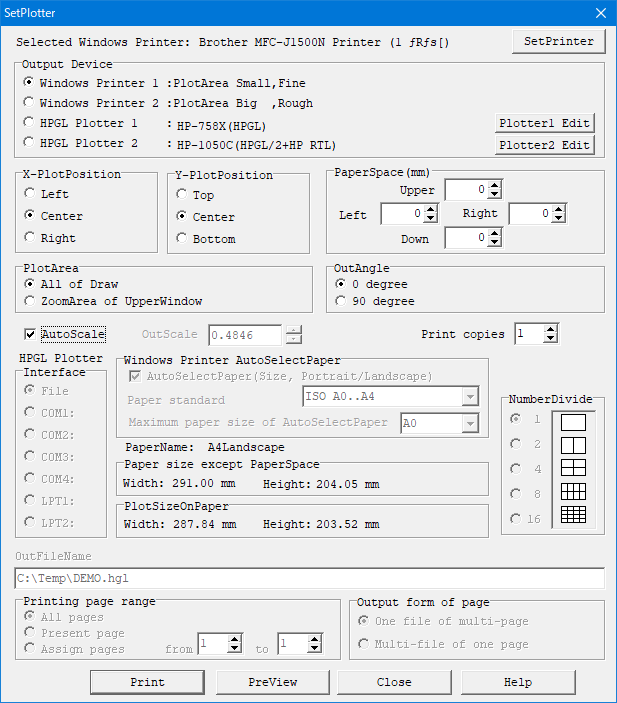 (5) The paper size was displayed in the preview window toolbar when previewing with printer output. (6) By double clicking the status bar of the main window, XY coordinates of HPGL unit (0.025 mm is 1 HPGL unit) are displayed in addition to ordinary XY coordinates. (7) When opening a multi-page drawing with different drawing size and previewing the plotter and printer output, we corrected to display abnormal. (8) Fixed the problem that character position shifted under extremely rare conditions. (9) Under the following conditions, we corrected the fault that black and white color selection was displayed incorrectly. (10) Fixed an obstacle in which filled figures are not displayed with EMF output. (11) When the special output version of PloView of automatic output is activated on the command line and the output type changes, the problem that the output condition becomes indefinite unless the same output is made in the dialog mode beforehand was fixed. (12) Improved reading accuracy of PDF files. PDF reading scale correction is automatically set during installation. PDF reading scale correction X, Y can be set in the input file setting. We prepared a button which can automatically set PDF reading scale correction X, Y in input file setting. PDF reading scale correction can be set automatically on the command line. (13) Changed the output scale in File - Convert PDF file menu as follows. Conventionally, the same value was used for Convert PDF file and PDF open, but this time separate memories are memorized. 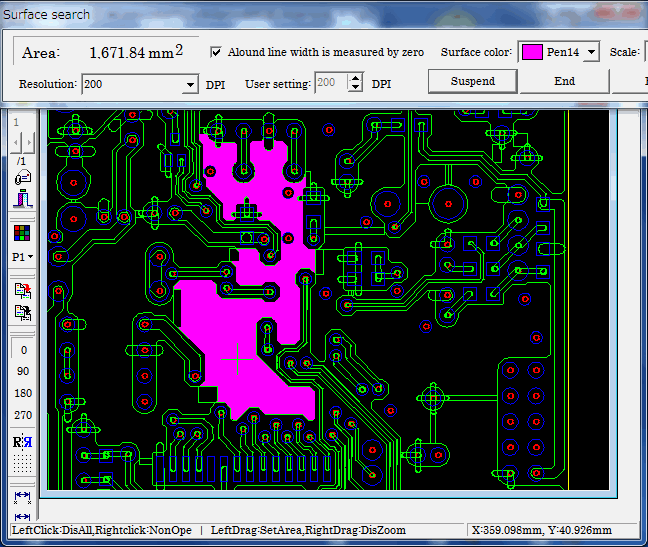 (14) Fixed the problem that the mirror does not be applied the hatching angle when DXF, SXF was output with mirror ON. (15) The accuracy of PDF output was improved. (16) Improvement of fine arc filling accuracy with various outputs. (17) When the resolution was over 45 degrees with CI (circle drawing) command of HPGL, it was drawing with octagon. We changed it to draw with a triangle when the resolution is 120 degrees or more. (18) With "Length measurement between points" and "Length measurement between lines", when the dimension measurement Dialog was displayed, it was pressed without pressing the "Start" button. Also, while designating measurement points, display commands other than mouse clicks can be issued. (19) The following obstacles to "Length measurement between points" and "Length measurement between lines" were improved. While measuring, press the end button after displaying the zoom with the middle mouse button, and drag display with the middle mouse button, the dimension measurement Dialog is displayed. (20) Improve not to flicker display when scroll bar is moved with drag mode ON. (21) When set to display the scroll bar, the problem that the zoom display area and the scroll bar display area do not match partially was fixed. (22) We adjusted the size of WindowsFont with PDF output. (23) We adjusted the size of WindowsFont with PDF output. (24) We adjusted the size of WindowsFont by screen display and image file output. (25) The initial color values of pen table No. 3 and 4 are matched with the color table of the comment file. When using this table, when converting the view file to the comment file, the pen number of the figure of the comment file becomes the same as the view file. (26) Fixed an obstacle that did not display the text color found in "Request-Text" as mark pen color. (27) When changing the pen table No., the mark pen number is changed so that the mark pen color does not change. (28) Kanji of HPGL specification is to switch to kanji mode and to use JIS code by LB (Label) command. However, there is data that uses ShiftJIS code in the case of not switching to Kanji mode (1 Byte mode). Therefore, even in such a case, we improved to display Kanji. (29) When Text size correction was set to something other than 100% with Set-Text, it did not work correction value or position of Text. We improved this. (30) If Text is on the boundary of the drawing size, influence the drawing area. Conventionally, when "Text size correction" is set to a value other than 100% in Set-Text, when opening a file, Text area was calculated with standard size. This was changed to the corrected size. (31) In case of combination of DV (horizontal writing, vertical writing character) instruction and LO (designation of left alignment, right alignment, centering of character string) instruction, there was a case where character misalignment occurred. We fixed this. (32) When the Slant angle of Text was other than 0 degree in PDF output, it displayed abnormally. We fixed this. (33) Fixed a problem that caused a system error if the file extension was not registered when specifying the file name to be opened on the command line. (34) When selecting the automatic paper selection for various kinds of output and the drawing size of the opened file coincides with the standard paper size, the one larger size was selected. We fixed this. (35) Some menu shortcut keys did not work. We fixed this. (36) When inputs DXF file, clockwise circular data was skipped. We fixed this. (37) It was not corresponded with DXF file input when Text width and Text space were minus (mirror display). Corresponding to this. (38) Text size at PDF input was adjusted. (1) A function to open multiple files at the same time and see by page feed was added. To open multiple files, hold down the Ctrl or Shift key and select the file in the Open dialog. The order in which files are opened will be the sorted order in the file open dialog. (2) The function to combine multiple files into one multi-page HPGL, PDF, TIFF, SXF file was added. (3) One file consisting of a plurality of pages is stored as a separate file (HPGL, PDF, TIFF, DXF, DWG, IGES, SXF, Bitmap etc.). A page number ranging from _001 to _999 is appended at the end of the file name. (4) For automatic output special specification version, you can use wildcard (*. Hgl) for input file name when launching PloView on the command line. This allows multiple files to be read at the same time. The order of opening files is alphabetical order of file names. (5) When multiple files are opened at the same time, [Multi-page file name] is displayed on the "Request-Input file attribute" menu. 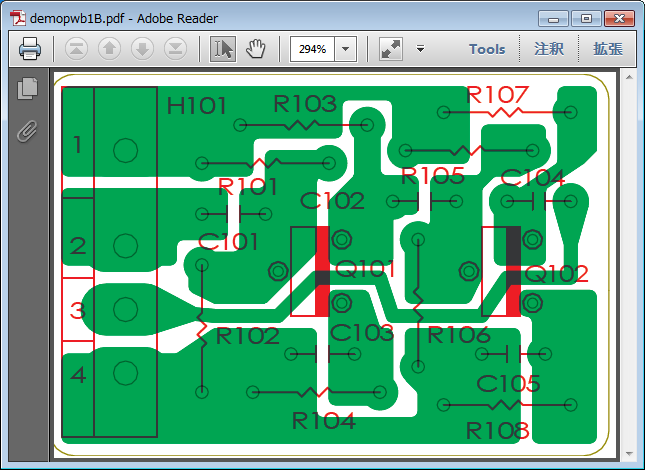 (6) Layer function added in PDF output. Layer attribute is added for pen color or page when multi page is off. 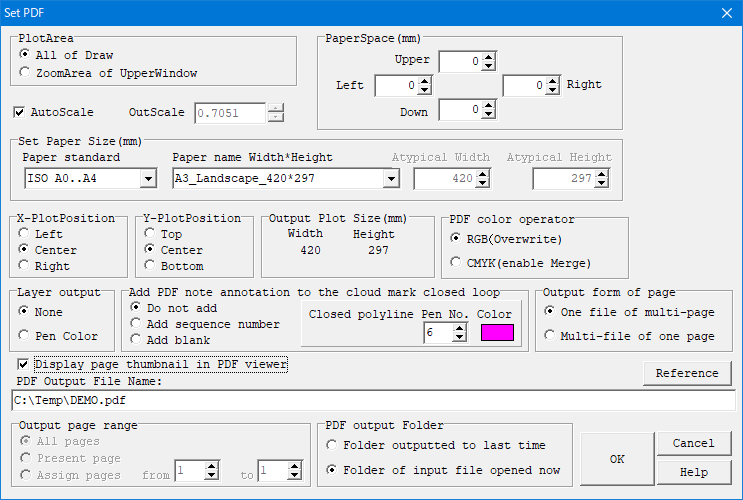 (7) Added a function to attach PDF notes annotation to cloud mark closed loop with PDF output. (8) When selecting the "File" "Create new comment" menu, the problem that the previously opened file remains is fixed. (9) The following functions were upgraded by drastically updating the PDF reading module. * Traditionally, when reading PDF files edited with PDF editing tools such as Acrobat, edited figures were not displayed. We made it to display. * Text reading processing was adjusted. * The clipping process was adjusted. (10) Processing speed has been greatly improved when multiple file conversion processing is performed at once for the automatic output special specification version. It is realized by newly preparing the next command line. PloView.exe /z "batch file name"
The batch file is a file conversion process of one line at a time, describing the conventional command line parameters, and this is described in plural lines. (11) When character width or character height is minus in reading EMF file, it was not displayed with mirror-on. We tried to display with mirror-on. (12) Fixed an error that caused automatic scale correction of PDF file setting by selecting set - input file menu. (13) When opening a file with edit ON, the window in the surface was changed from filling to alternate filling. 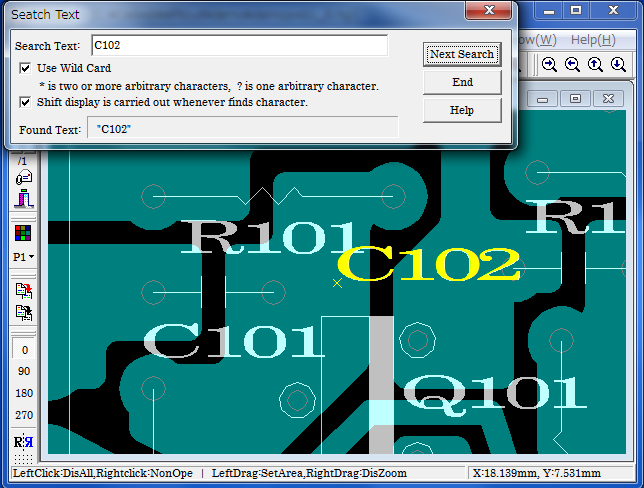 (14) At the time of EMF output, the character width sometimes became abnormal depending on the situation. We fixed this. (15) When the origin of Bitmap data is outside the drawing area, the position of the Bitmap is displayed displaced at Plotter output. We fixed this. (16) We modified the garbled character by conditions in HPGL file output. (17) An error occurred when the width of the drawing size or the height was zero in the image file output. We fixed this. 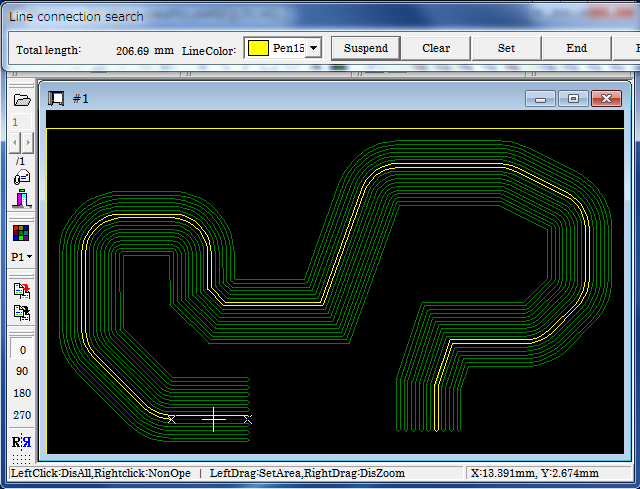 (18) In DXF, DWG output, polyline error sometimes occurred. We fixed this. (19) Fixed a problem that an error occurs although files are created by PDF to XPS conversion. (20) Fixed a problem that PCL conversion from PDF can not be done. (21) Added "Display page thumbnail in PDF viewer" function in PDF output. (22) Output "Output page range" as "Prezent page" with various outputs. After that, we fixed the problem of outputting present page when outputting with "Assign Pages". 1.The downloaded file is compressed into the ZIP type. 2.Our product has been virus checked. 3.This HP is always put up only the latest version. Acquisition of an old version becomes impossible. Please copy the downloaded file to a data medium for re-installation. function of auto-output special edition of the formal version is lost.